Inequality in the Promised Land is now available! 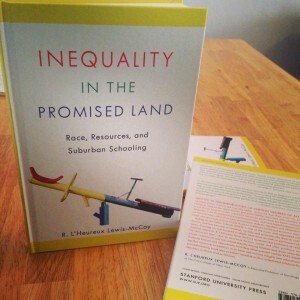 After many years of research and writing, my first book, Inequality in the Promised Land: Race, Resources and Suburban Schooling is now available. It’s certainly been a labor of love, but definitely worth every word on the page! I’m excited for you to get a chance to read it and hope that it opens up some understanding, conversations and assists those seeking solutions to educational inequality, on all fronts. One of the things I am consistently asked is, “Why suburban school inequality?” Because the suburbs aren’t the sitcom sterile place they have been projected to be. With the tremendous diversification of suburbs, both racially and economically, we now know that more than half of Black children in urban areas are raised in the suburbs. Suburban schools have often been considered an educational ideal but this is not the case. Inequality in the Promised Land takes you into the homes and hallways of suburban schools to figure out what works, what’s broken, and offers guidance on repairing unequal experiences. In this book I hope that parents, educators, and concerned citizens will find their experiences captured and the kindling for change . If you’d like to know more about the book, check out this profile of my research. Right now you can pick up the book (paperback or hardback) at Stanford University Press (use discount code S14SOC) or via Amazon. I’ll be announcing more about its availability in brick and mortar stores as well as in other formats (ibooks, kindle). I look forward to you reading along with me! !